Since its discovery in 1976, Ebolavirus has caused periodic outbreaks of viral hemorrhagic fever associated with severe and often fatal disease. Ebolavirus is endemic in Central Africa and the Philippines. Although there is currently no approved treatment available, the past 10 years has seen remarkable progress in our understanding of the pathogenicity of Ebolavirus and the development of prophylactic and post-exposure therapies against it. In vitro and in vivo experiments have shown that Ebolavirus pathogenicity is multifactorial, including viral and host determinants. Besides their function in the virus replication cycle, the viral glycoprotein, nucleoprotein, minor matrix protein and polymerase cofactor are viral determinants of pathogenicity, with evasion of the host innate and adaptive immune responses as the main mechanism. Although no licensed Ebolavirus vaccines are currently available, vaccine research in non-human primates, the 'gold standard' animal model for Ebolavirus, has produced several promising candidates. A combination of DNA vaccination and a recombinant adenovirus serotype 5 boost resulted in cross-protective immunity in non-human primates. A recombinant vesicular stomatitis vaccine vector protected non-human primates in pre- and post-exposure challenge studies. Several antiviral therapies are currently under investigation, but only a few of these have been tested in non-human primate models. Antisense therapies, in which oligonucleotides inhibit viral replication, have shown promising results in non-human primates following post-exposure treatment. In light of the severity of Ebolavirus disease and the observed increase in Ebolavirus outbreaks over the past decade, the expedited translation of potential candidate therapeutics and vaccines from bench to bedside is currently the most challenging task for the field. Here, we review the current state of Ebolavirus research, with emphasis on prophylactic and therapeutic intervention strategies. The genus Ebolavirus (EBOV) in the Filoviridae family contains five distinct species . Ebolaviruses are known for their ability to cause devastating viral hemorrhagic fever outbreaks in humans and great apes, but the natural reservoir for EBOV has remained elusive for many years. The recent detection of EBOV antibodies and viral RNA in several African fruit bat species indicated their role as a natural reservoir for EBOV [2–5]. EBOV was discovered in humans during two concurrent outbreaks in 1976. One of these occurred in the Democratic Republic of Congo and was caused by Zaire ebolavirus (ZEBOV) , whereas the other, unrelated outbreak that occurred in Sudan was caused by Sudan ebolavirus (SEBOV; Table 1) . ZEBOV caused several more outbreaks between 1994 and 2008 in Gabon, the Democratic Republic of Congo and the Republic of Congo, with a case-fatality rate ranging from 60% to 90%. SEBOV reemerged in Sudan in 1979 and 2004 and in Uganda in 2000 to 2001. SEBOV has a case-fatality rate of 40 to 60% . *Multiple independent outbreaks. Abbreviations: BEBOV, Bundibugyo ebolavirus; CIEBOV, Côte d'Ivoire ebolavirus; REBOV, Reston ebolavirus; SEBOV, Sudan ebolavirus; ZEBOV, Zaire ebolavirus. Reston ebolavirus (REBOV) was discovered in 1989 during a disease outbreak in cynomolgus macaques imported into the US from the Philippines . Outbreaks of REBOV occurred again in 1990, 1992 and 1996 in the US and Italy in cynomolgus macaques imported from the same facility in the Philippines and, in 2008, REBOV emerged in domestic pigs in the Philippines . REBOV has not yet been associated with disease in humans, but there is evidence for REBOV infection in humans in close contact with REBOV-infected macaques and swine [10–12]. Côte d'Ivoire ebolavirus (CIEBOV) was discovered during an epizootic (animal epidemic) in chimpanzees in the Taï National Park in Côte d'Ivoire in 1994, in the first confirmed introduction of an EBOV into a great ape population . So far, CIEBOV has only caused a single, non-fatal human case. In 2007 to 2008 a large outbreak of viral hemorrhagic fever with a case-fatality rate of approximately 25% occurred in humans in Uganda. The causative agent of this outbreak was identified as a novel species of EBOV, Bundibugyo ebolavirus (BEBOV) . ZEBOV, and to a lesser extent CIEBOV, are responsible for devastating outbreaks in the African great ape populations, with ZEBOV being associated with the decline in great ape populations in the Congo basin [15–17]. Symptoms of Ebolavirus disease usually occur after an incubation period ranging from several days to 3 weeks . Onset of disease symptoms is sudden and consists of fever, headache and muscle and joint pain and progresses to include diarrhea, loss of appetite (anorexia), vomiting, chest pain, shortness of breath, coughing and a maculopapular rash (a skin rash consisting of discoloration and raised spots). At the peak of illness hemorrhagic manifestations develop, although not in all cases; these include blood in the stools (melena) or vomit (hematemesis), small hemorrhages under the skin (petechiae), and bleeding from the nose, gums, from venipuncture sites and from the conjunctiva of the eye. Ultimately, fatal cases progress to coma, shock and death [7, 18]. Massive production of proinflammatory cytokines, the absence of type I interferon (IFN) production, the absence of antibody induction and loss of peripheral CD4+ and CD8+ T lymphocytes are correlated with fatal outcome in EBOV infections [19–21]. EBOV forms a filamentous particle of uniform diameter but variable length and shape (Figure 1). The viral envelope is derived from the host cell membrane on which the EBOV envelope glycoprotein (GP), which mediates entry into the host cell, is expressed. The EBOV negative-strand RNA genome contains seven genes and is encapsidated by the nucleoprotein (NP). The encapsidated genome, the minor nucleoprotein (VP30), the viral polymerase (L) and the polymerase cofactor (VP35) are required for replication and transcription of the viral RNA. The matrix protein (VP40) is required for budding of the virus particle from the plasma membrane; the minor matrix protein (VP24) facilitates virus budding . GP is produced only after translational editing; the primary gene product of the gene that encodes GP is soluble GP (sGP) , a nonstructural protein of poorly understood function, which was shown to reverse the permeability-increasing effect of TNFα on endothelial cells and partially restore the endothelial barrier function of these cells . Determinants of Ebolavirus pathogenicity. Schematic representation of an Ebolavirus particle. The roles of GP, NP, VP24 and VP35 in the pathogenesis of EBOV, as discussed in the main text, are indicated. Here, we provide an overview of our understanding of EBOV pathogenicity and the progress in development of vaccines and antivirals for the prevention and treatment of EBOV infection. We also discuss the potential role of genomics in EBOV research. Apart from direct tissue damage resulting from EBOV replication, the severity of EBOV disease also results from indirect effects of virus replication, such as the induction of proinflammatory cytokines, depletion of T lymphocytes and coagulation abnormalities. In experimental infection of cynomolgus macaques, it was shown that the disseminated intravascular coagulation observed in patients is most likely not a direct result of replication of EBOV in endothelial cells . Instead, in vitro experiments showed that GP causes endothelial cell activation, as indicated by upregulation of cell adhesion molecules, and a decrease in endothelial barrier function, potentially leading to edema and shock . The mucin domain of GP, a highly glycosylated region, has a dual effect in counteracting host adaptive immunity: not only does the mucin domain shield epitopes on GP that could otherwise be recognized by antibodies, it also shields major histocompatibility complex I molecules, thereby impairing antigen presentation by the host cell [24, 25]. Another effect of GP on the host adaptive immune response is the presence of a 17-mer peptide that causes apoptosis of CD4+ and CD8+ cells in vitro . Besides adaptive immunity, GP also affects the innate immune system by inducing proinflammatory cytokines and suppressor of cytokine signaling 1 (SOCS1) through interacting with Toll-like receptor 4 . GP counters the host antiviral activity of tetherin (also known as Bst-2 or CD317), which retains virus particles at the cell surface after budding, through a direct interaction of GP with tetherin  (Figure 1). VP24 and NP were shown to be important determinants of pathogenicity in vivo; mutations in these proteins were responsible for adaptation of ZEBOV to mice  and guinea pigs  through their ability to counteract the IFN-induced innate immune response  (Figure 1). Although it is not clear how NP counteracts the innate immune response, it has been shown in experiments in vitro that VP24 prevents IFN-α/β-induced gene expression and counteracts the antiviral effects of IFN-β by interacting with karyopherin-α1 (also known as importin-α) . Karyopherin-α1 mediates nuclear import and, by interacting with this protein, VP24 prevents nuclear accumulation of phosphorylated signal transducer and activator of transcription 1 (STAT1) , thereby preventing IFN-induced cell signaling. Two regions of VP24 are involved in the interaction with karyopherin-α1 and counteracting the innate immune response: residues 42 and 142-146 . VP35 functions as an important determinant of pathogenicity through blocking IFN-α/β production  (Figure 1). In vitro, VP35 prevents the activation of interferon regulatory factor 3 (IRF-3) by blocking the virus-induced phosphorylation of this protein . IRF-3 phosphorylation is blocked by VP35 through several mechanisms. First, VP35 binds to double-stranded (ds)RNA, through residues 309 and 312 [35, 36], thereby preventing dsRNA-mediated activation of retinoic acid-inducible gene 1 (RIG1), which would normally result in phosphorylation and nuclear translocation of IRF-3 and subsequently expression of the IFN-α/β genes . Second, VP35 is phosphorylated by κB kinase epsilon (IKK-ε) and TANK-binding kinase 1 (TBK-1), thereby impairing the interaction of these kinases with their substrates IRF-3 and IRF-7 and preventing their phosphorylation . Finally, through an interaction with the protein inhibitor of activated STAT1 (PIAS1) and the ubiquitin-conjugating enzyme Ubc9, VP35 is involved in the SUMOylation of IRF-3 and IRF-7, resulting in decreased transcription of the IFN-β gene . The ability of VP35 to bind dsRNA also prevents the phosphorylation of dsRNA-regulated protein kinase R (PKR), which would otherwise result in the phosphorylation of translation initiation factor eIF-2α and thus block protein synthesis [39, 40]. Whether the block of PKR phosphorylation is achieved through dsRNA binding of the amino- or carboxy-terminal domain of VP35 is not clear [39, 40]. Yet another in vitro effect of the ability of the carboxyl terminus of VP35 to bind dsRNA is the suppression of RNA silencing . The importance of dsRNA binding of VP35 in vivo was shown in guinea pigs; in these animals, a virus with mutations at residues 319 and 322 that no longer bound dsRNA was avirulent, whereas the wild-type virus was lethal . Finally, it was shown that the amino terminus of VP35 affects maturation of dendritic cells. In dendritic cells, VP35 suppresses upregulation of co-stimulatory molecules and pro-inflammatory cytokines and attenuates their ability to activate CD4+ T cells . Several host genes and proteins that might be involved in the pathogenicity of EBOV have been described. A microarray analysis of human hepatoblastoma cells showed that, following infection with EBOV, acute-phase genes, complement genes and genes involved in regulation of coagulation are downregulated . Analysis of gene expression in sequential peripheral blood mononuclear cell samples from EBOV-inoculated non-human primates (NHPs) showed only very few changes in gene expression in the first days after infection; among the earliest observed changes was an increase in expression of IFN-regulated genes from day 2 and 3 after infection onwards. From day 4 after infection onwards, a dramatic change in the gene expression profile was observed, including upregulation of proinflammatory cytokines, chemokines, TNFα- and NFκB-regulated genes, apoptosis-regulating genes and fibrin-dissolution genes . More specific host proteins involved in EBOV replication have also been identified. For instance, it was shown in vitro that RhoB and RhoC, members of the small GTP-binding RhoGTPase family, enhanced entry of EBOV into cells . Inhibition of heat-shock protein 90 (Hsp90) in vitro resulted in inhibition of EBOV replication . Furthermore, it was shown that a large number of host cell proteins are incorporated in EBOV particles. Knocking down expression of several of these proteins using small interfering (si)RNA resulted in reduced viral replication, indicating the relevance of the incorporation of these proteins into virus particles . Understanding the molecular mechanisms behind the pathogenicity of EBOV and identification of host factors required for efficient EBOV replication can aid in the development of therapeutic and prophylactic treatments for EBOV. Vaccination is considered one of the primary control strategies for infectious diseases in the human population; however, no licensed EBOV vaccines are currently available. The first attempts to generate EBOV vaccines consisted of classical formulations of inactivated virus with different adjuvants, such as Ribi adjuvants or lipid A-containing liposomes [49–51]. Although some studies resulted in protective immunity in rodent models, most of these strategies were not successful in protecting NHPs from lethal challenge with EBOV. The relative ease with which protection is generated in mouse and guinea pig models seems to have limited predictive value for vaccine efficacy in NHPs, the 'gold standard' animal model for EBOV . However, these rodent models are still valuable for pre-screening vaccine candidates before they advance into NHP models. The lack of success with classical vaccine approaches naturally led to the search for effective vaccine formulations based on the latest developments in the field, such as viral-vector-based vaccines, DNA vaccines and virus-like particles (VLPs) in a variety of prime-boost strategies. The advantage of using these novel vaccine approaches over the classical vaccine approach is the more robust induction of both innate and adaptive immune responses, humoral as well as cellular, resulting in a better vaccine efficacy. Recent studies into the correlates of protection against EBOV infection suggest that a humoral immune response alone is not sufficient for protection against EBOV infection, but should be combined with a sufficient activation of the CD4+ and CD8+ T lymphocytes in order to confer protection [53–57]. The most promising vaccine approaches against EBOV infections are discussed below and in Table 2. *Licensed for the treatment of sepsis-induced coagulation disorders. †The antithrombotic potential of rNAPc2 in orthopedic surgery and coronary revascularization was tested. ‡Only FGI-106 was tested therapeutically. Abbreviations: HPIV3, human parainfluenza virus type 3; NHP, non-human primate; rhAPC, recombinant human activated protein C; rNAPc2, nematode anticoagulant protein c2; rVSV, recombinant vesicular stomatitis virus; VLP, virus-like particle. DNA vaccines are purified plasmid preparations containing one or more DNA sequences of the pathogen of interest that are expressed in the recipient on delivery. A DNA vaccine expressing ZEBOV GP elicited a protective immune response in mice  and partially protected guinea pigs . A prime-boost vaccine strategy of four inoculations with DNA vectors encoding ZEBOV GP and SEBOV GP and a boost with a recombinant adenovirus 5 vector expressing ZEBOV GP generated cross-protective immunity in NHPs against a heterologous challenge with BEBOV . There are currently no licensed DNA vaccines for use in humans; however, a three-plasmid DNA vaccine encoding ZEBOV GP, SEBOV GP and NP elicited a cellular and humoral immune response in humans after three injections of vaccine in a phase I clinical trial . Several veterinary DNA vaccines against various viruses are currently licensed, including a DNA vaccine for West Nile virus in horses . Recombinant viral vaccine vectors can consist of vectors capable of replication or of replication-deficient vectors. The adenoviral vector is a replication-deficient vaccine vector with a broad cellular tropism used in a wide variety of gene therapy studies. As mentioned above, a combination of a DNA vaccine prime and adenovirus vector boost was able to protect NHPs from lethal BEBOV challenge . In addition, the incorporation of ZEBOV and SEBOV GP in a single adenovirus vector provided complete protection in NHPs against ZEBOV and SEBOV challenge, demonstrating the potential of generating immunity against different EBOV species in NHPs . A recently completed phase I clinical trial showed that recombinant adenovirus serotype 5 expressing ZEBOV and SEBOV GP was safe for use in humans . The use of replication-competent vector-based vaccines has been very successful in the development of veterinary vaccines; ten recombinant poultry vaccines are currently licensed . For EBOV, replication competent recombinant vesicular stomatitis virus (rVSV) vectors expressing EBOV genes have been generated successfully. A single administration of rVSV expressing ZEBOV GP elicited complete protection of NHPs from homologous challenge, but not from heterologous SEBOV challenge . A multivalent vaccine composed of equal parts of rVSV expressing GPs of Marburgvirus (MARV), ZEBOV and SEBOV offered protection against challenge with MARV, ZEBOV, SEBOV and CIEBOV in NHPs . Another important potential of the rVSV-based EBOV vaccines is their use as post-exposure treatment. When rVSV with ZEBOV GP or SEBOV GP was administered to NHPs 30 minutes after homologous EBOV challenge, the rVSV vaccine was able to protect 50% of ZEBOV-infected animals and 100% of SEBOV-infected animals [67, 68]. The rVSV ZEBOV GP was recently used to contain a potential laboratory exposure with ZEBOV and was administered 40 hours after the incident . Another replication-competent viral vector, human parainfluenza virus type 3 (HPIV3) expressing ZEBOV GP, was highly immunogenic after two intranasal administrations and protected NHPs from homologous challenge . 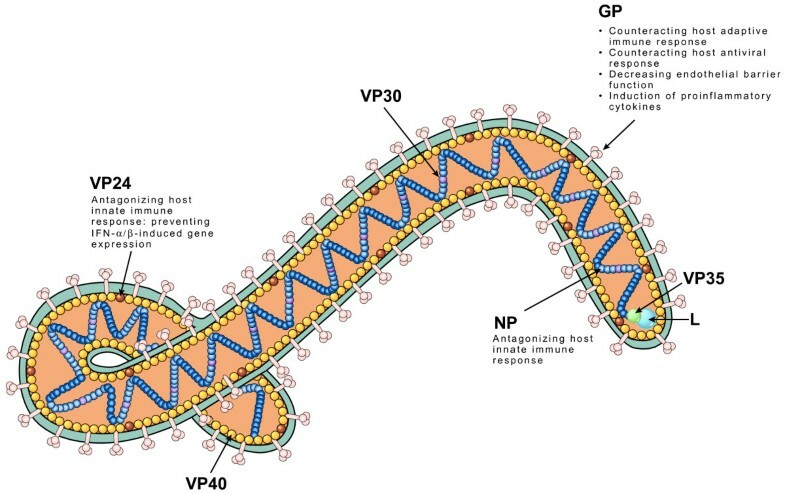 VLPs are particles generated by the expression of one or more viral proteins and mimic the natural viral conformation but do not contain viral genetic material. EBOV VLPs were generated by simultaneously expressing GP, NP and VP40 of ZEBOV in 293T cells, combined with Ribi adjuvant and administered three times to NHPs, resulting in protection against homologous ZEBOV challenge . Another vaccine candidate recently investigated was a replication-deficient ZEBOV lacking the VP30 gene. Two vaccinations with this virus protected mice and guinea pigs from lethal ZEBOV challenge . Although there are now promising vaccine candidates, the correlates of protection from EBOV infection are still poorly understood. Combining existing vaccine candidates with research into the correlates of protection and applying genomics strategies should result in improved vaccines effective as post-exposure treatment and/or vaccines that cross-protect against all four African EBOV. There has been an active search for effective therapeutic treatments for EBOV infection; unfortunately, these have so far had limited success (Table 2). Licensed therapeutics for the treatment of other viral infections, such as IFN-α2b and ribavirin (used for the treatment of, for example, hepatitis B and C virus) did not show prophylactic or therapeutic value for the treatment of EBOV [73, 74]. Limited therapeutic efficacy was seen with recombinant human activated protein C (rhAPC), a drug licensed for the treatment of sepsis-induced coagulation disturbances: two out of eleven NHPs survived a lethal ZEBOV challenge and there was a significant increase in time to death . More promising results were obtained using nematode anticoagulant protein c2 (rNAPc2), a drug under evaluation for treatment of coagulation abnormalities through inhibition of the fVIIa tissue factor complex. rNAPc2 was able to protect three out of nine NHPs after a lethal ZEBOV challenge using both prophylactic (10 minutes before challenge) and post-exposure (24 hours after challenge) treatment regimes . Pre-exposure treatment of NHPs with a neutralizing monoclonal antibody failed to protect them when challenged with a lethal dose of ZEBOV . The discovery of effective EBOV antiviral compounds has been hampered by the need for biosafety level 4 (BSL4) facilities to work safely with EBOV and the lack of high-throughput screening technologies. The development of alternative screening strategies, such as the use of VLPs and pseudotyped VSV, as well as of minigenome systems, has enabled the screening of compound libraries in a high-throughput manner at lower containment level (BSL2). In addition, the increased number of BSL4 laboratories combined with the development of reverse genetics technologies for EBOV , leading to the creation of EBOV expressing green fluorescent protein (EBOV-GFP) [79, 80], has enabled high-throughput screening of anti-EBOV compounds within high containment laboratories. The screening of compound libraries using EBOV-GFP has identified several compounds showing in vitro and in vivo antiviral activity. The antiviral compounds FGI-103, FGI-104 and FGI-106 showed in vivo efficacy against ZEBOV in a mouse model following treatment before and throughout the remainder of the study with these compounds [81–83]. FGI-106 also conferred complete protection to mice challenged with ZEBOV when administered from the time of challenge onwards, and 90% protection with post-exposure treatment . EBOV enters the host cell by fusion of the viral envelope and the host cell membrane. Given that several other enveloped viruses use a similar process, this allows the development of compounds with broad-spectrum antiviral activity. One such molecule, LJ001, was discovered using a pseudotyped VSV virus with a luciferase reporter . LJ001 binds to the virus envelope and inhibits virus-cell fusion for a large range of enveloped viruses, including EBOV. Pretreatment of mice with LJ001 reduced ZEBOV mortality by 80%, but the compound did not show any efficacy in a post-challenge model, presumably as a result of limited bioavailability . Currently, the most promising studies in antiviral treatment of EBOV use the ability of virus-gene-specific oligonucleotides to interfere with translation of viral mRNA. This antisense strategy inhibits EBOV replication, resulting in a reduction in the pathogenic effects of EBOV and allowing the immune system more time to clear the infection. A combination antisense strategy targeted at ZEBOV L, VP24 and VP35 was an efficacious post-exposure treatment in several rodent and NHP studies [85–88]. Depending on the time of intravenous treatment, 66% or 100% of NHPs were protected from lethal challenge . A similar study, using chemically modified oligonucleotides called phosphorodiamidate morpholino oligomers, conferred 60% protection against lethal ZEBOV challenge in NHPs following intraperitoneal, subcutaneous and intravenous administration. Although the 30- to 60-minute interval between ZEBOV challenge and the start of the therapeutic treatment used in both studies indicates the potential of antisense therapy in the treatment of accidental exposures, the feasibility for effective use in an outbreak setting remains to be determined. In the past decade, there has been significant progress in the general understanding of EBOV replication and pathogenesis. The increased availability of BSL4 facilities and the development of molecular tools to study parts of the basic biology of EBOV under BSL2 conditions will undoubtedly lead to a more comprehensive understanding of EBOV in the near future. The increasing capability and capacity of tools such as mRNA expression profiling, high-throughput and 454 sequencing and RNA interference technologies have greatly contributed to our knowledge in biomedical research, including virology. These new technologies have been rapidly implemented in fundamental and clinical research settings. The broad range of applications in virology of these new genomic technologies encompasses areas such as epidemiology, viral pathogenesis, host response and the development of diagnostics, vaccines, and antivirals. However, in comparison with other viral pathogens, such as influenza A virus and HIV, research of EBOV has only marginally benefitted from these developments. A more extensive use of genomic and post-genomic approaches in EBOV research will probably result in a rapid advance in our understanding of EBOV pathogenesis and virus-host interactions, such as receptor usage, viral replication or interactions with innate and adaptive immune responses. The identification of interactions of EBOV with host cell factors, such as Hsp90, and other potential targets for therapeutic intervention [46–48] may result in targeted design of antiviral therapeutics . Likewise, the availability of EBOV genomic sequences and understanding of the virus replication cycle may allow novel vaccine approaches, such as 'reverse vaccinology' . Future EBOV research should therefore focus on understanding the cellular processes involved in EBOV replication and pathogenesis, using broad genomics and proteomics approaches, combining data obtained in experimental settings in vitro and in vivo. Whereas the screening of compound libraries has yielded promising candidates with potent antiviral characteristics, the solving of crystal structures of EBOV proteins and their associated biological function will hopefully result in the rational design of antiviral drugs, similar to antivirals used for the treatment of HIV and influenza A virus [91–94]. Moreover, in the absence of vaccines or antivirals directed at EBOV, research should be aimed at interfering with the indirect effects of EBOV replication, such as modulating the innate immune response and preventing lymphocyte depletion and coagulation abnormalities. Here, we have highlighted several promising candidates for vaccine and antiviral use (Table 2). In the light of the severity of EBOV disease and the observed increase in outbreaks over the past decade, the expedited translation of these potential candidate therapeutics from bench to bedside is of the utmost importance. The severity of EBOV disease and the sporadic nature of outbreaks render normal phase III efficacy trials neither ethical nor feasible. However, the availability of the so-called 'animal rule' allows the licensing of vaccines or antivirals on the basis of evidence in well-characterized animal models, in addition to the phase I and phase II requirements [95–97]. Therefore, it is crucial to validate the existing NHP models with respect to their feasibility to function as models for human EBOV infection. In addition, it is crucial to obtain more in-depth knowledge on the correlates of protection against EBOV infection, both for vaccines and antivirals, using genomics and proteomics approaches, which will allow a more targeted vaccine and antiviral design approach. Lastly, clear identification of the target populations for the various therapeutic intervention strategies is necessary. Whereas most of the discussed post-exposure vaccine and antiviral therapeutic strategies will be particularly useful in laboratory incidents and outbreak situations, prophylactic vaccine strategies targeting the rural populations in EBOV endemic regions in general are questionable. Specific targeting of certain risk groups or ring vaccination (vaccination of all individuals in a prescribed area around an outbreak) approaches during outbreaks seem more feasible but would still require a combined international effort to ensure the deployment of available vaccines where most needed. Moreover, although the focus of the therapeutic intervention strategies has been largely on preventing EBOV disease in humans, similar approaches are urgently needed to prevent the introduction and spread of EBOV into the endangered gorilla and chimpanzee populations of Central Africa, which could be pushed to the brink of extinction by EBOV outbreaks. The authors thank Anita Mora for help with figure design. This work was supported by the Division of Intramural Research, National Institute of Allergy and Infectious Diseases, National Institutes of Health. HF claims intellectual property for VSV-based filovirus vaccines. EdW and VJM declare that they have no competing interests. All authors contributed equally to the concept, literature search, writing and figure design for this manuscript.